Missouri Irish Setter Rescue View other Irish Setters for adoption. 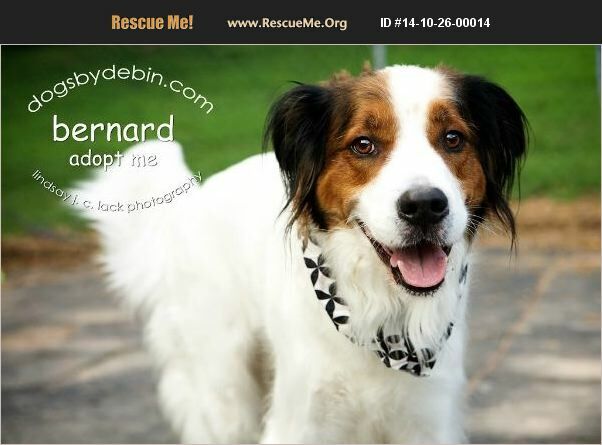 Bernard is a 7 year old mix, most likely St. Bernard & Irish Setter. He is large, but not huge. He is a curious & smart boy that would benefit from an active owner that likes to walk or run. Bernard will need a 6ft privacy fence or on a leash with his owners while outside, for a least a while. Bernard does not do well in tight spaces. We recommend a dog savvy home with no children & minimal visitors. He ignores other dogs so a home with no other pets is best as well so all time can be dedicated to this fella. Bernard had had training, knows basic obedience & is potty-trained. We would require his new family to continue his training. Bernard has been in sheltering for a while waiting for that right person that is ready to give a dog a hand up. Are you that someone? Interested? Please visit http://bit.ly/1m78fU5 to complete our quick online adoption application from your computer or desktop (not a phone). A representative will email you within 24-hours. Please do not come in until you are pre-approved. Bernard's adoption fee is $175 & includes: Neuter, vaccines, microchip, deworming, a heartworm test & an offer of pet healthcare insurance for 30-days from adoption date. Thank you!